The Sigerson Cup favourites needed two goals in extra-time to wrap up this first round win. AFTER MISSING A hatful of chances both in regulation time and early in extra time, Ulster University finally capitalised on their superior power up front with goals by Ryan McHugh and Michael McEvoy which proved decisive. UU had led late in the match by three points before scores by Seamus Carroll and Eoin Cleary, twice from placed balls and the last of them deep into injury-time, put Garda College back on level terms and threw the tie into extra-time. But Garda could only score once more during that additional period, a brilliant point by Cleary from the left wing, while UU added 2-13 and that was enough. It was a match which boiled over at times, particularly in a second half which yielded three red cards – two for UU and one for garda – and was ultra-competitive until the second of those goals was converted. Both of the green flags were fisted efforts, Ryan McHugh getting on the end of a passing move involving Mark Bradley and Niall Madine, and shortly after the turnaround McEvoy finished off some nice inter-passing by Paddy McBrearty, Cathal Boylan and Madine. Scorers for UU - P McBrearty 0-7 (6f), N Madine 0-4, R McHugh 1-1, E Rafferty 0-3, M McEvoy 1-0. Scorers for Garda - T McDaniel 0-6 (5f), S Carroll 0-2, C Fitzmaurice 0-2, P Morris 0-1, Brendan Murphy 0-1, E Cleary 0-1. Email “1-8 for Donegal duo as 13-man Ulster University avoid shock Sigerson defeat to Garda”. 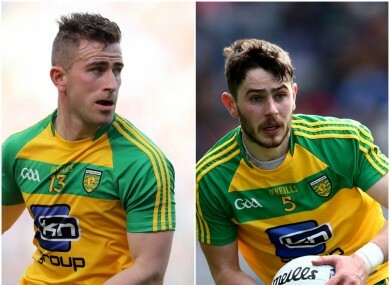 Feedback on “1-8 for Donegal duo as 13-man Ulster University avoid shock Sigerson defeat to Garda”.